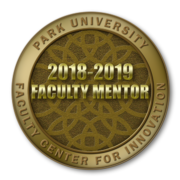 Criteria to be a faculty mentor will vary each term depending on the needs of the new faculty and can range from experience teaching a particular course online to course development experience in a particular discipline. Collegiality is essential to mentoring. One year of teaching online in the Park undergraduate program is generally required although exceptions can be made for high demand disciplines/courses that require expertise in external platforms. Evidence of successful teaching in the online modality at the undergraduate level at Park is required by receiving a satisfactory score through a system of peer review. Examples are the Peer Review of Online Teaching (PROT) Fellows program, a prior peer review program at Park like the Faculty Online Observation, or a departmental peer review. Faculty mentors should be highly versed in best practices in online teaching. Individualized training for mentors is provided on an as-needed basis by lead mentors as new faculty and the courses they teach vary greatly from term to term. Group training/professional development is provided each term through webinars. To maximize the benefit of peer-based mentoring, adjunct faculty are paired with adjunct faculty mentors, and full time faculty are paired with full time faculty mentors whenever possible. New course developers and program coordinators are paired with faculty mentors from the same discipline/school who also serve in those roles. New undergraduate online instructors participate in the Online Instructor Mentoring Program (OIMP) where they receive one-on-one peer mentoring throughout their first term teaching. Both adjunct and full time faculty teaching online undergraduate courses are welcomed into the program. Faculty mentors are volunteers and work closely with a lead mentor. As the OIMP is discipline oriented, mentors serve in the specific discipline in which they teach when possible. Course-specific mentoring is ideal. This program is virtual, so location is not a factor. Mentors are located across the country. The OIMP provides opportunities to the faculty mentors for professional development including virtual sessions where mentors can connect and ask questions to peers, lead faculty mentors, and guest experts. Faculty mentors are enrolled in PDL751, a resource center and forum area for mentors.